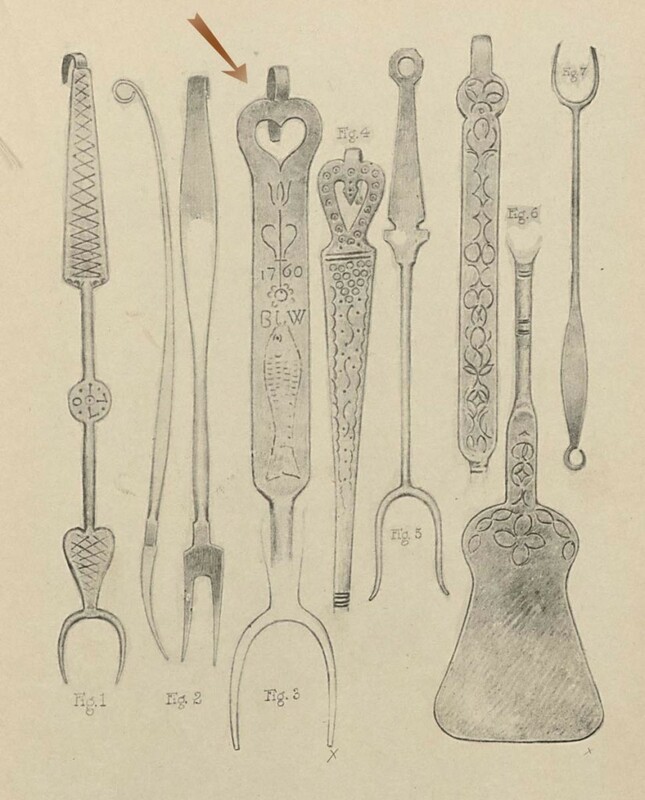 During H. F. du Pont’s lifetime, many scholars and collectors corresponded with him, visited Winterthur, included examples from his collections in their publications. Du Pont valued their insights and encouraged them to autograph his copies of their publications. 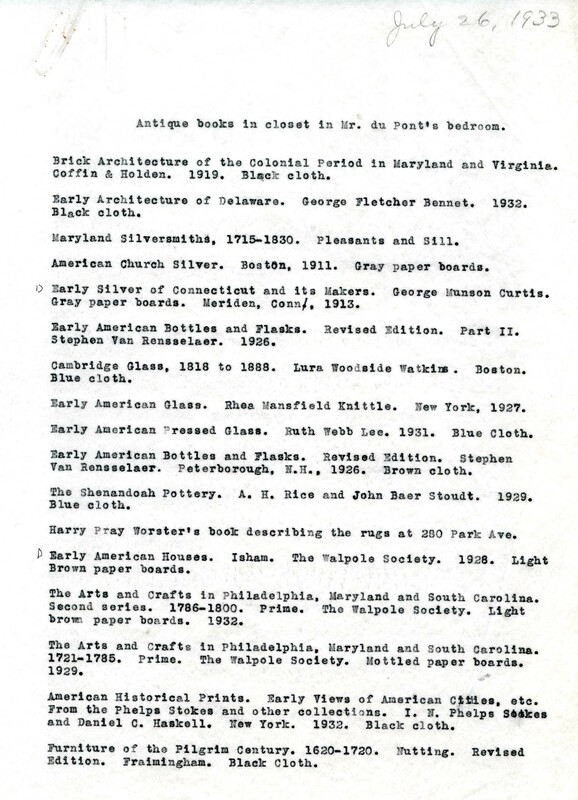 This 1933 book list reveals that the closets of H. F. du Pont’s bedroom and study were always piled with the most current reference books. 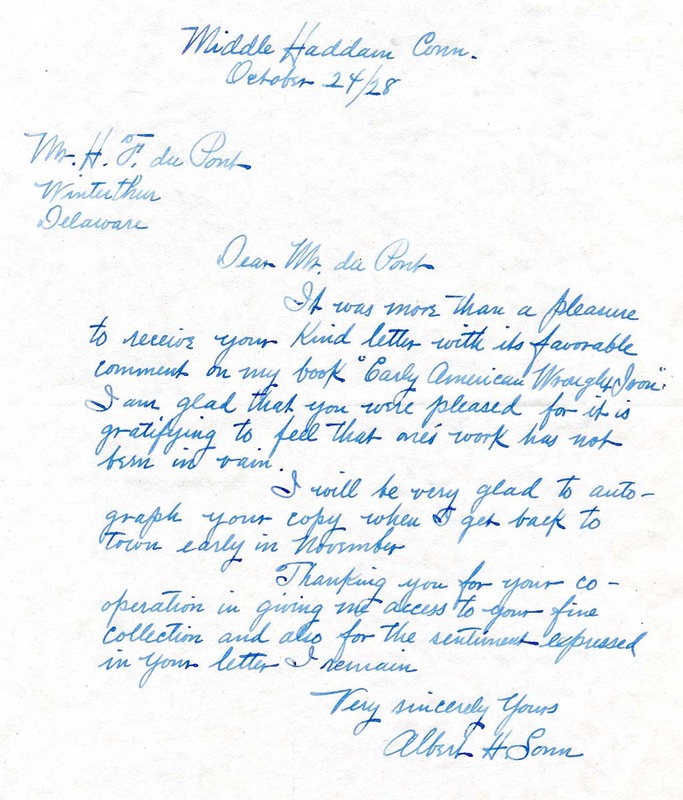 The list suggests the breadth of his interests during his most active collecting period. Books helped to document the antiques already at Winterthur and to suggest new acquisitions that could enhance the scope and artistic quality of du Pont’s collection. 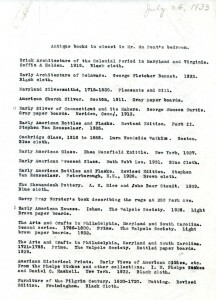 Most of the volumes on this list are now part of Winterthur Library. 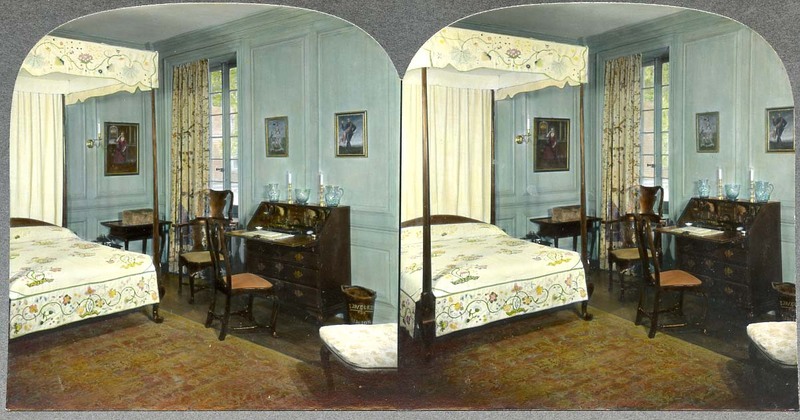 Among the historic textiles that H. F. du Pont purchased are these extremely rare polychrome curtains, which hung in his bedroom. 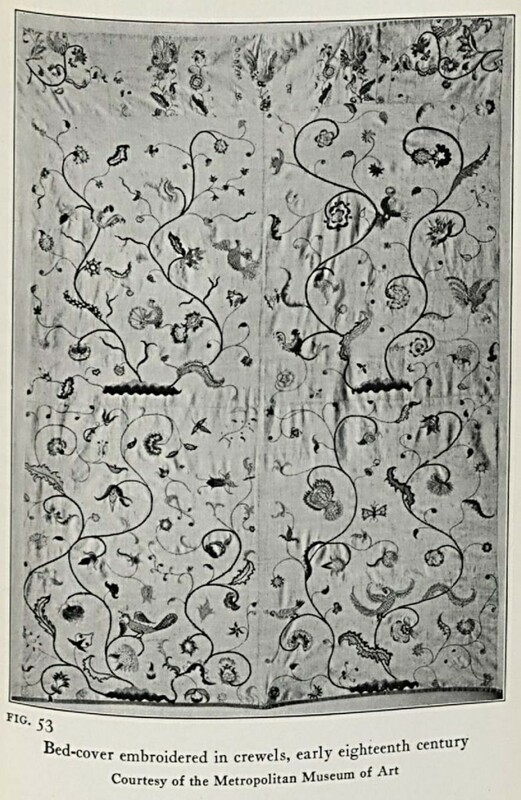 The embroidered panels were made to imitate the painted Indian cottons first exported to England in the 1600s. Du Pont relied on publications such as Frances Little’s Early American Textiles to document the origin, function, and significance of these important curtains. Little’s pioneering work on textile manufacturing and history has remained an important reference to this day. 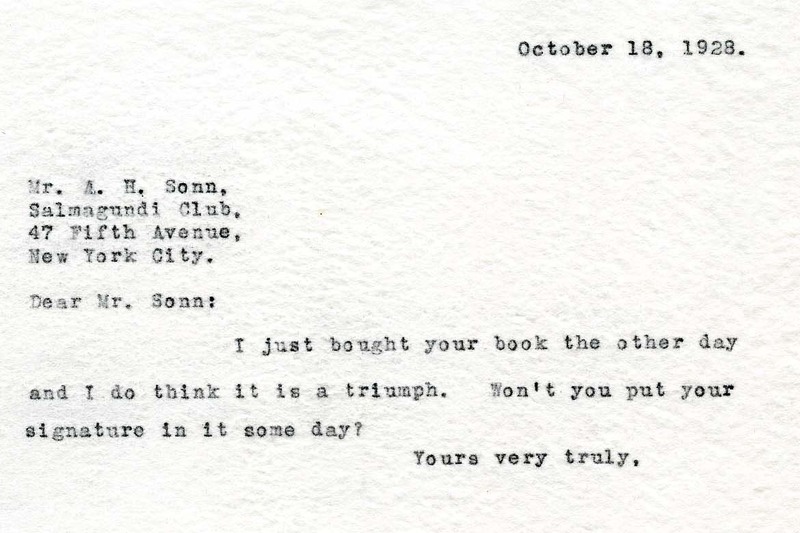 Like many scholars, Albert H. Sonn visited Winterthur, corresponded with H. F. du Pont, and included examples from Winterthur in his publication. In his three-volume work, Sonn compiled a comprehensive survey of examples that provides a foundation for classifying and dating early wrought-iron artifacts. As an enthusiastic collector of early wrought iron, du Pont valued Sonn’s insights as well as the autographed copy of his work. This wrought-iron fork illustrated by Albert Sonn in his book was probably made in Pennsylvania and presented as a wedding gift. It is notable because of the inscribed date, the fine workmanship, and the heart and tulip design typical of Pennsylvania German craftsmen. Sonn’s illustration documents the relationship of this fork to other kitchen utensils of similar date and origin.